ANANDA ASHRAMA was founded in Southern California in 1923 by Swami Paramananda as an extension of the Vedanta Centre in Boston. Situated in the foothills of the Sierra Madre Mountains, at an altitude of more than 2000 feet, the ashrama covers 120 acres of hillsides, canyons and meadows. 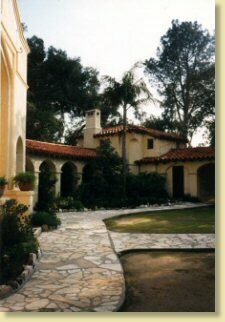 Trees, gardens and rock-lined pathways provide a peaceful retreat for spiritual study and prayer. The ashrama is a non-sectarian place of worship dedicated to all the religions of the world, where people of different faiths may come together and worship the One Spirit Who is called by many names. Our philosophy is based on the universal teachings of Vedanta as expounded by India's 19th century mystic and world teacher, Sri Ramakrishna. His chief disciple Swami Vivekananda brought Vedanta to the West in 1893. The Vedanta Centre of Boston was founded in 1909 by Vivekananda's youngest disciple, Swami Paramananda. Another Ananda Ashrama was established on the South Shore of Massachusetts in Cohasset in 1929. This sister ashrama is now the permanent headquarters of the Vedanta Centre. Ananda is the Sanskrit word for bliss. An ashrama is a spiritual retreat. Ananda Ashrama, therefore, is a retreat where one strives to live by and practice spiritual life in order to realize the joy of the Divine. Viswamandir, was built in 1928 under the direction of our founder, Swami Paramananda, and dedicated to all the world's great religions, many of which are represented by stained glass windows, symbols, statues, and spiritual quotations. The purpose of the centers in the United States is to present authentic knowledge of Indian philosophy, as well as to stimulate better understanding between the East and West on a spiritual basis. Through our services and classes, we emphasize practice of the universal truths taught in all great religions: love and service together with study, prayer and meditation. Our primary aim is to stress the life of selfless dedication and to create an atmosphere of serenity and peace. We also have two sister ashramas in Calcutta, India. The mission of these ashramas is to train and serve destitute women and children through schools, an orphanage, and a shelter. Till all wandering souls have reached their goal in safety.